Hi, everyone, and Happy July. This year is going quickly. Fortunately, all seems well in both my shops, Barkery and Biscuits, and Icing on the Cake. Business is good, and I've been able to hold adoption events in the Barkery often. I always enjoy doing things to help pets who need new homes. My own dog Biscuit helps a lot by encouraging me--and tasting treats. Plus, as always, I enjoy continuing my job as a veterinary technician on a part-time basis. And in my town of Knobcone Heights? Well, things are going fine at the moment. But... well, you may already know that I've had to solve a fourth murder there. Yes, I really had to. You may know that I'm now in a relationship with Dr. Reed Storme, one of the veterinarians at the clinic where I work. He'd been telling me to stay out of attempting to solve murders, for my own safety. But when he wound up being the main suspect? Well, you can guess what happened. He encouraged me to help, as long as I was careful about it. What happened then has now been memorialized in the fourth book about me: Pick and Chews. As always I have mixed emotions about being featured that way, but hopefully those books help the business in my stores. And guess what. Linda O. Johnston, the person who writes those books, has told me that this is a special month at the blog site where this will be posted--Killer Characters, according to her. There are book giveaways every day. 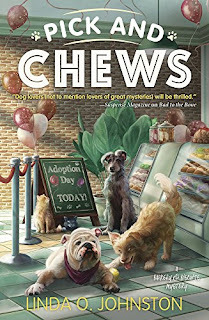 And she'll be giving away a copy of Pick and Chews to one of the people who posts a comment on this blog. So... well, good luck to all of you. Be sure to leave a comment to get a chance to win. She says it'll take a few days, but one of you will wind up winning a book. And me? Well, I hope this is the last story I wind up starring in... but I've been informed there are more murders likely to occur in this amazing, fun--but sometimes dangerous--little town. PICK AND CHEWS, the fourth Barkery & Biscuits Mystery by Linda O. Johnston, is a May 2018 release. And leave a comment here for a chance to win a copy! First of all, I love the cover! This sounds like such an interesting premise. Original and fun. I love the titles and the covers. The books are a treat as well. I would like to work in a bakery,especially one with adoption days! Would love to discover a new series. Thanks, mlarkin at rmrgroup dot com. Hang in there, Knobcone Heights needs you. I do believe that yes, you really had to solve a fourth murder there. What if there is a fix. My Pug Pep and I love your bakery. Thanks for the giveaway. Love the series - on my library's wait list for Pick and Chews. This sounds like a great addition to the series. Would really like to read "Pick and Chews". I've been planning on starting your series. I'm loving the cover. Need to begin the series. Ah, a new-to-me author! The book sounds right up my alley as I love cozy mysteries with animals included as part of the main character. We have three furbabies that are rescues from different shelters at different times. I really enjoy this series!! This is Carrie talking. Linda O. Johnston is traveling but she said she would choose a winner on her return. Thanks for commenting. I love animal cozies. The book sounds great. I love the sound of this series and I would love to read this. Thank you for the chance. I love the cover. I can't pass up a story with dogs included.